Cars are parked along a road damaged by a powerful 6.7-magnitude earthquake in Japan's Hokkaido prefecture, in a photo taken Thursday. A landslide in Atsuma town, Hokkaido prefecture, caused by the powerful earthquake that hit the Japanese island of Hokkaido. A magnitude 6.7 earthquake struck Japan's northern island of Hokkaido at about 3 a.m. Thursday morning, triggering massive landslides and widespread power losses that left thousands in the dark and forced a decommissioned nuclear power plant into backup power. Seven people have been confirmed dead, with 300 injured and about 33 missing on the island of 5.3 million people, according to Reuters. 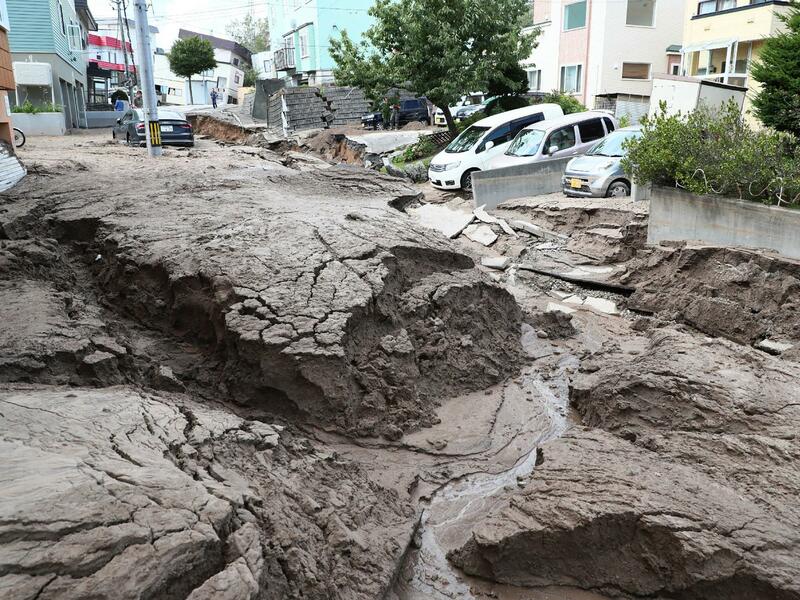 Landslides along a ridge in the town of Atsuma wiped out several homes and officials feared that residents could be trapped inside. Thousands of rescue workers have been mobilized to help dig people out of the rubble. Nearly 3 million buildings lost power after the quake rocked the island, NHK reported. According to the Associated Press, "Economy, Trade and Industry Minister Hiroshige Seko told reporters that the extensive power outage was caused by an emergency shutdown of the main thermal power plant that supply half of the electricity to all of Hokkaido." Reuters writes, "The situation at utility Hokkaido Electric Power's three-reactor Tomari nuclear plant provided an uncomfortable, if comparatively brief, echo of the Fukushima Daiichi nuclear disaster in 2011. Reactors there melted down after a massive tsunami knocked out back-up generators, designed to maintain power to cool reactors in emergencies." "Though Tomari was shut down after the Fukushima disaster in 2011, it needs electricity to keep fuel rods cool, and had to rely on back-up diesel generators that kicked in after the quake until power was restored to all three reactors by 1 p.m. local time," the news agency said. NHK reported that public transit, including all high-speed Shinkansen and local trains, have been suspended. Flights have also been grounded. Prime Minister Shinzo Abe said 25,000 troops had been deployed to assist in rescue operations in Hokkaido. The epicenter of the quake was about 16 miles from the Hokkaido's main airport in the city of Chitose — about 70 miles south of Sapporo. A series of aftershocks followed the initial temblor, the Japanese Meteorological Agency reports, but it said there was no tsunami risk. An official from the agency, Toshiyuki Matsumori warned residents to expect further aftershocks in the coming days, according to The Japan Times. 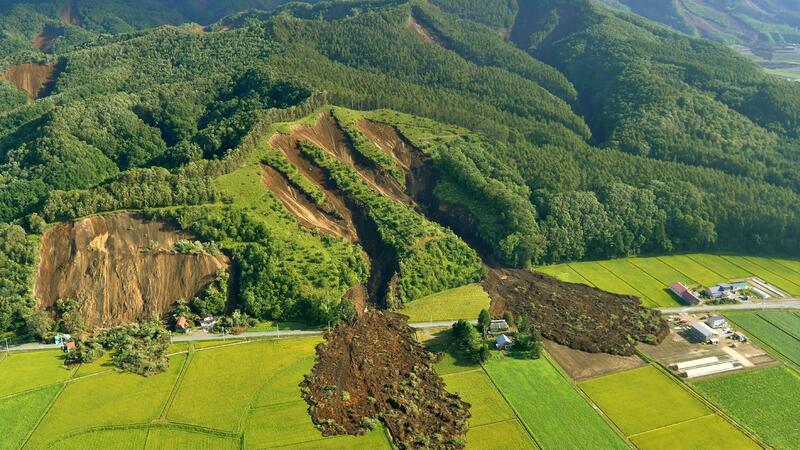 Thursday's earthquake comes less than a day after a powerful typhoon killed at least 11 people in western Japan.